Some travelers seek plush, queen-size beds and waterfront views. Others yearn for a changing horizon and the open road. 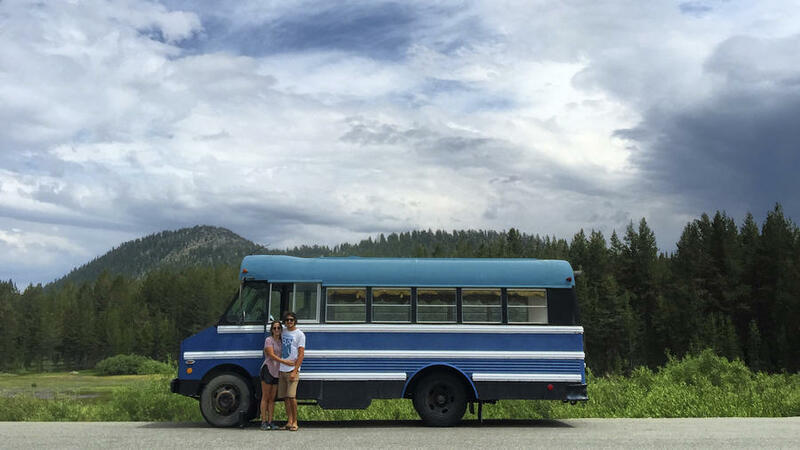 Lake Tahoe residents, Nick Cahill and Jessica Perez, soak up the best of both worlds with their , a vehicle that’s part vacation vessel, part tiny home. Mid-way through the epic tiny home renovation, Cahill and Perez will soon have a complete kitchenette, a queen-size bed that converts into two 4-person love seats, a reclaimed granite rock fireplace; solar power, a , plus a that fits anywhere from 8 to 10 people. As the media director of Force 12 Media, Inc. and a who recently claimed the cover of a National Geographic issue set to publish this fall, Cahill’s account comes with enough shots of handiwork and nature to please DIYers and travel fiends alike. Garnering over 2,400 Instagram followers, Cahill and Perez’s ambitious venture has already attracted a range of sponsors including: , , , , and . What’s next? Looks like we’ll have to wait and see. Explore Cahill and Perez’s road less traveled via .